I have recently lost my quasi-Book Club, that was not. So you, dear reader (if there is anyone actually reading this) will have to be part of my new solo Book Club. Since the abolishment of my Book Club That Was Not I have not had the time to read a book, or at least I didn't make the time to read one. Upon leaving Hometown to make the journey back to Capital City, my Nana offered to lend me a book "Well actually it's your Mom's book," she said. 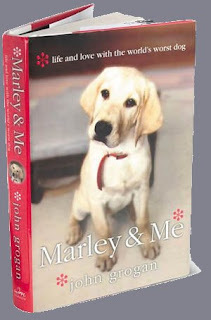 The book was John Grogan's Marley & Me. I decided to crack the book on Friday evening, spending the night in with a book is FREE* right? I finished the book up on Sunday afternoon, and well it was a pretty good read. It made me laugh it made me cry and it made me want to get a dog of my own. Thankfully I'm not really the impulsive type, so here I bang away at the keyboard still sans Dog. John Grogan set out to tell the story of Marley the Dog, but what he ended up with was the story of his life, his marriage and his children, as Marley the dog was an intricate part of their lives. One of the morals that comes through in the story is a feeling that life for all of us could be much better off if we just learned to find our inner dog. I would recommend Marley & Me to any animal lover, especially those of you that have or had a dog. If you're not the book reading type, from what I understand they have recently made a movie of the same title, so enjoy. While reading John Grogan's story of his very bad dog it brought back many memories of my Mother's dog, Delaney. Delaney passed away almost a year ago, and when it happened my Mom was devastated. As I am slightly emotional deficient I could not really empathize with my Mom, until I read this story. Marley & Me brought back memories of the quiet times I would spend with Delaney, where I was convinced that she could speak and was only pretending to be a dog. I remembered her clumsiness, how she would always bash her head into chairs. I remember every time I came to visit how Delaney would great me like I was a Rock Star the moment I walked in the door. I started to understand why her death effected my Mom so much, and I selfishly thanked fate that I was not around when she passed away. Delaney is still part of my Mom's house, she now resides in a small urn that is adorned with her collar. It sits on the mantel above the big screen television in the family room. Just like the Grogan's, my Mom and Step-Father have gotten a new dog, well actually they got two, their sisters and they are Labs. Tessa and Roxy's first couple of months of existence could have been taken straight out of Marley & Me, and I think the rest of their life may just follow the same destructive and humourous storyline. There is nothing I can do but to bid them good luck. You see, when you get down to it the dog we love makes just as many mistakes as we do. I was reading on a train when Marley was about to pass away. I had nothing to wipe the tears from my eyes as the two said goodbye. They really need us so much and are there for when we are down. Perfect.